A gourmet treat that looks mouthwateringly (I just made that word up) delicious and impressive. So quick and easy it can be prepared in minutes. Not really a recipe but rather the clever culinary use of fresh local seasonal ingredients prepared simply to create a light brunch, lunch or dinner. Accompany with a freshly dressed salad of seasonal leaves using my Simple Vinaigrette. Roast the large cap mushrooms as per this recipe with or without chilli. Lightly toast the slices of bread and place on plates. Rub bread with cut garlic and spread on some butter. Remove the roasted mushrooms from the oven. Place on top of the garlic crouton you have just prepared. Add the crumbled pieces of oven crisped Prosciutto or Jamón Serrano. Softly poach the eggs and gently place on top of the mushrooms. Garnish with extra crumbled garlic croutons. And there you have it – a meal in minutes. Be the first to learn about class updates and if you like, Like us on Facebook. 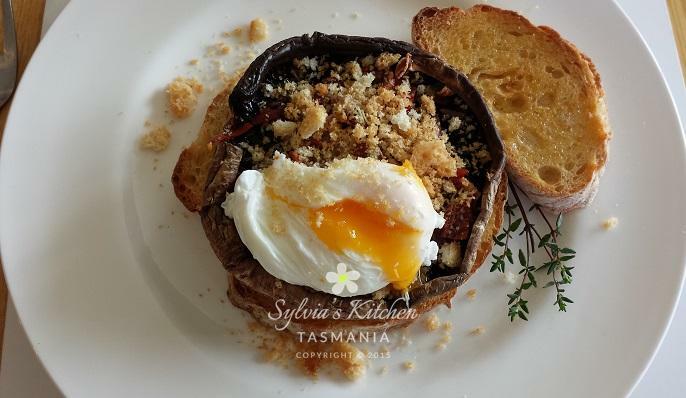 This entry was posted in Autumn, Local Produce, Recipes, Vegetarian, Winter and tagged cooking with mushrooms, eggs, vegetarian recipe.